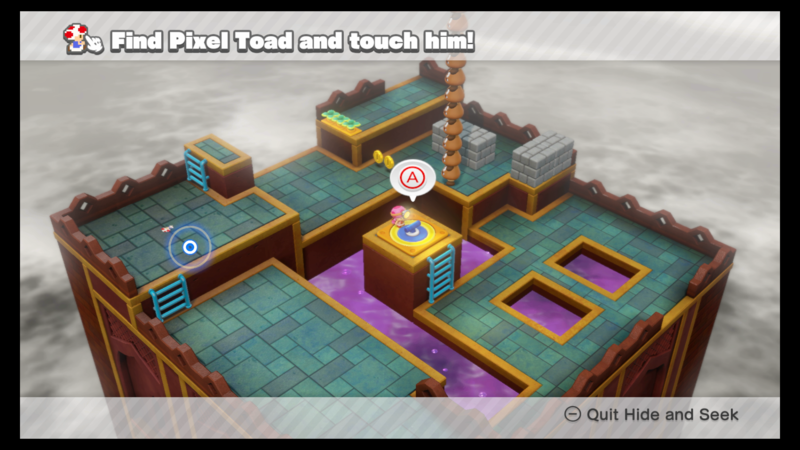 Captain Toad: Treasure Tracker is all about collecting things. Gems, stars, and coins are scattered throughout your adventure and you can only progress through the game by collecting them. Pixel Toads are one of these collectables. 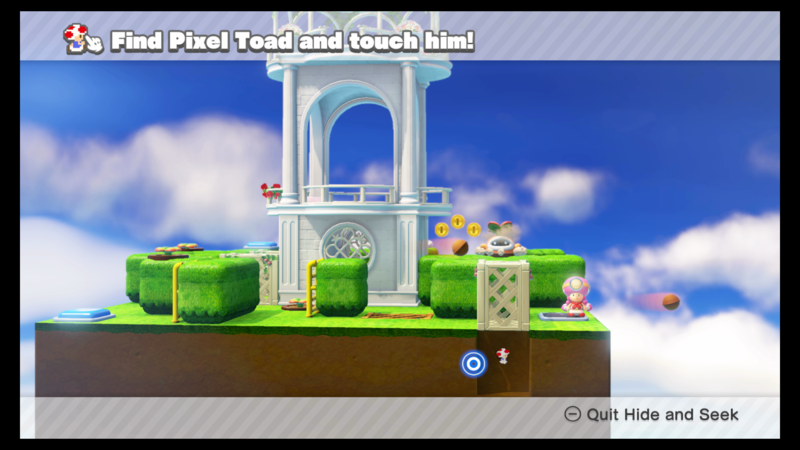 They're small little Toads that hide somewhere on each level for you to find. By finding them all in a single episode, you'll unlock a special Pixel Toad badge at the front of your book. 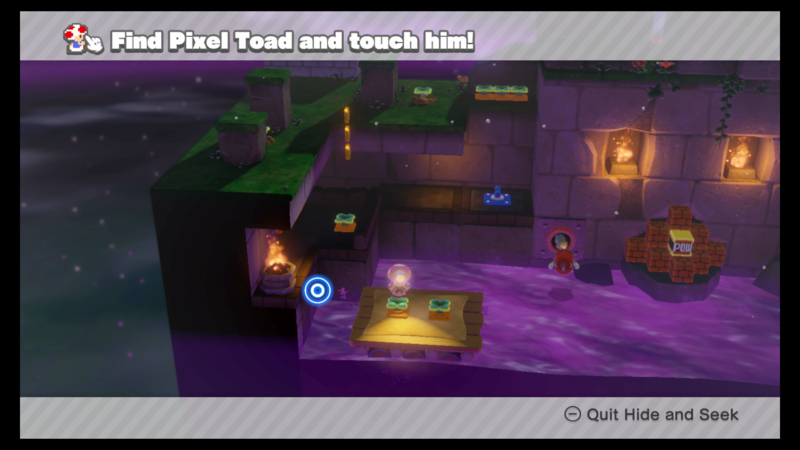 To get the Pixel Toads, all you need to do is find and touch them on the Nintendo Switch system. 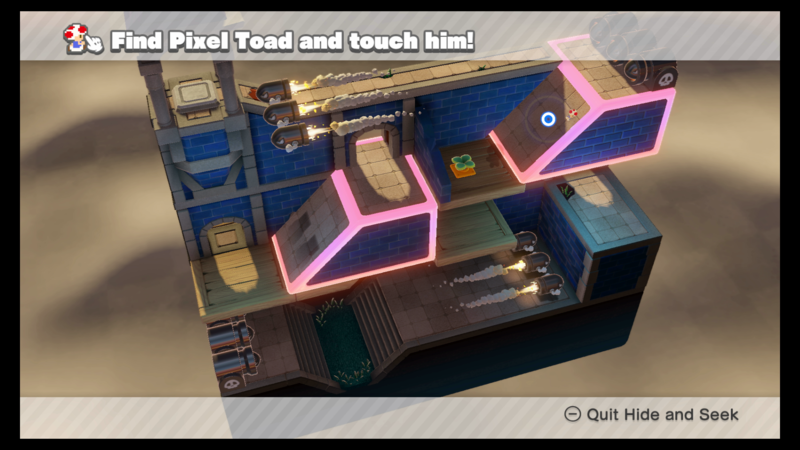 The Toad will then be collected and you can move onto the next one. To help you on your quest, we've found all of the toads in Episode Two of the game and highlighted them in the screengrabs below with a blue marker. 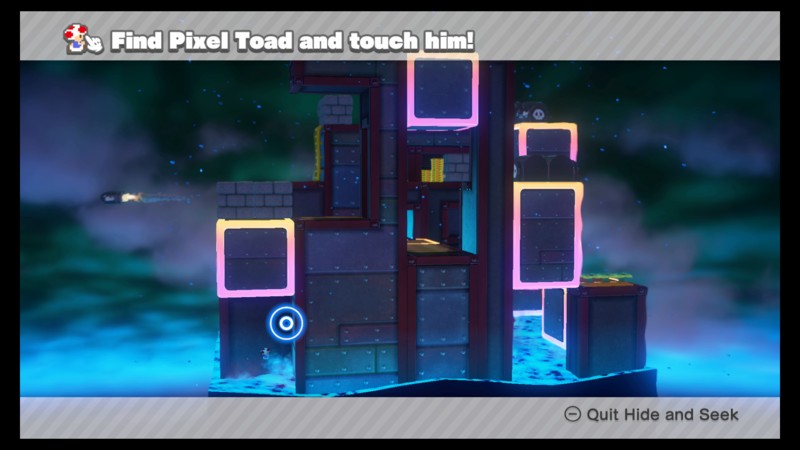 The first Pixel Toad is located on the first blue slide you encounter. 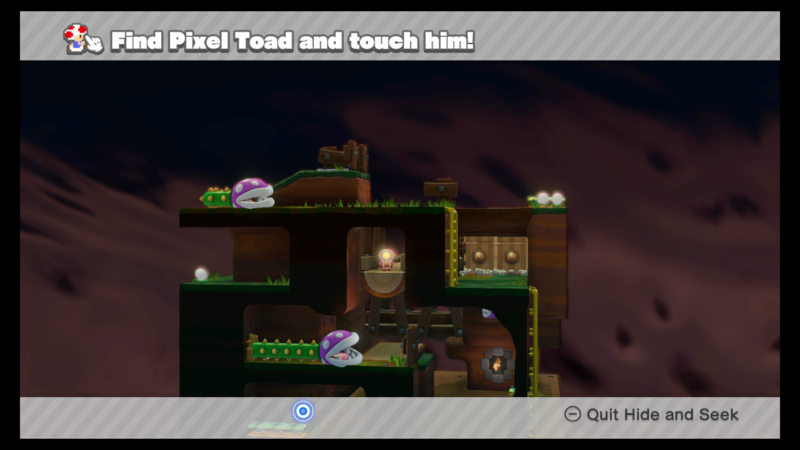 This pesky Toad is hiding behind the third Piranha Plant closest to the star. 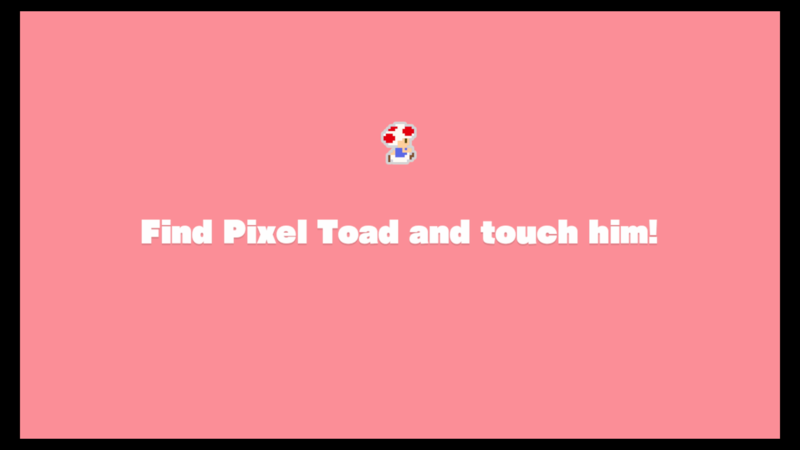 A Pixel Toad is awaiting you at the end of the level just as you jump off the cart. A pesky Toad is hiding behind the poster in the distance. This Toad is relaxing next to the pink park bench where you spawn. This Toad can be found on the opposite side of spawn. 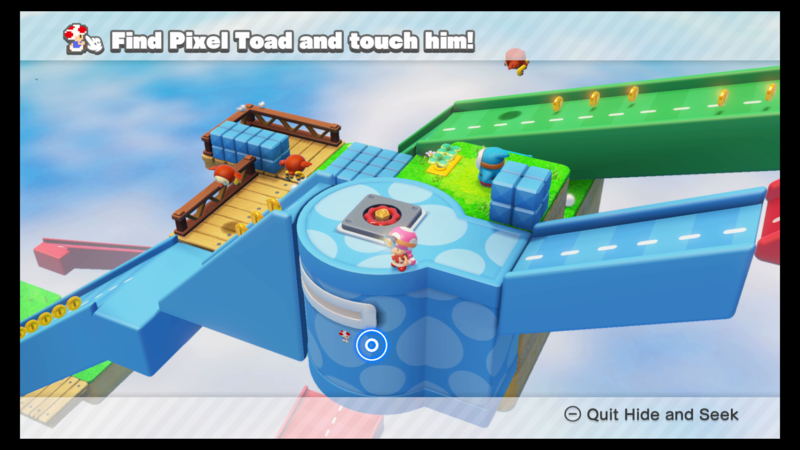 Just jump on the platform and as it moves, the Toad will appear. 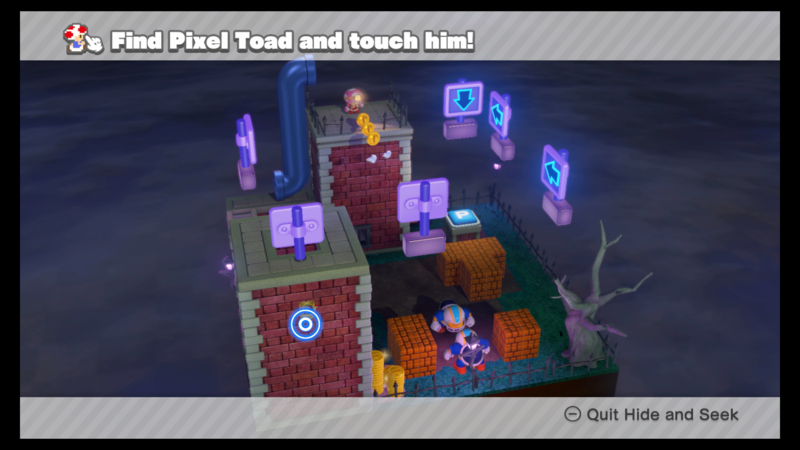 This easy-to-find Pixel Toad is hiding on the top-most platform. 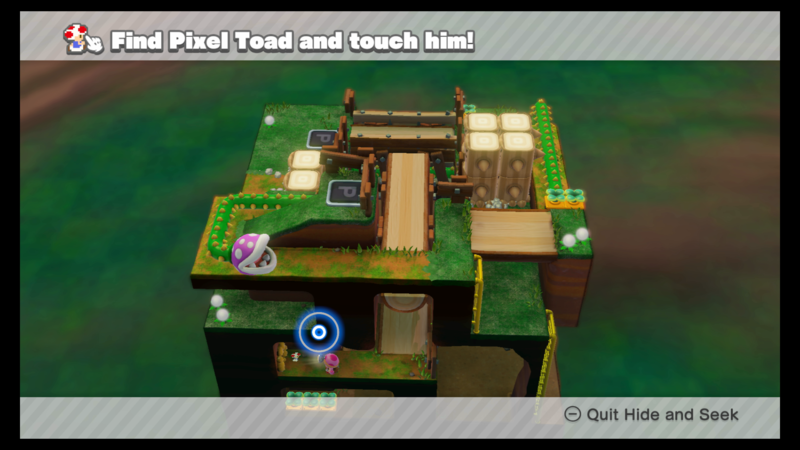 This Toad is located at the end of the map. Use your flashlight to find it next to the star podium. Climb up the level until you reach the spiraling platform. 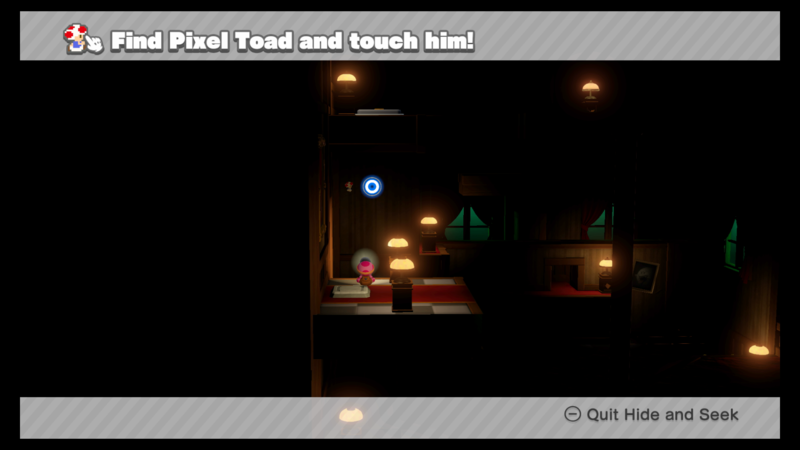 Crank it up a little bit and Toad will be hiding underneath it. This pesky Toad is hiding under the level. Head through the purple pipe to find him. This Toad is hiding on the wall between the two stair platforms. 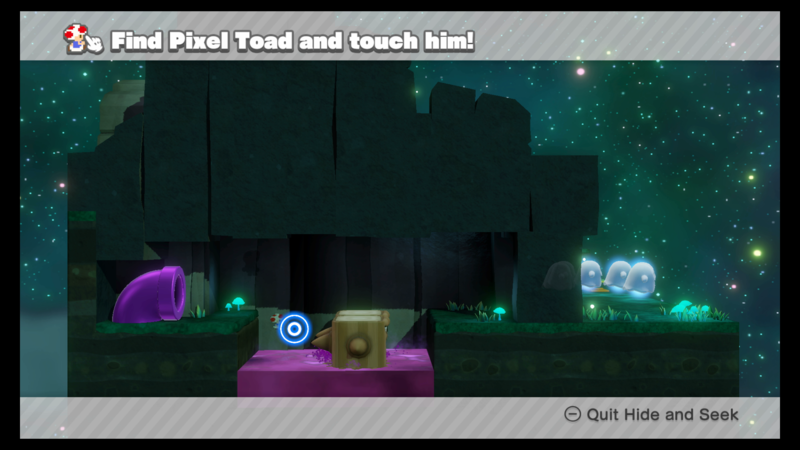 Press one of the buttons to lift the white block up and find a Pixel Toad hiding underneath. 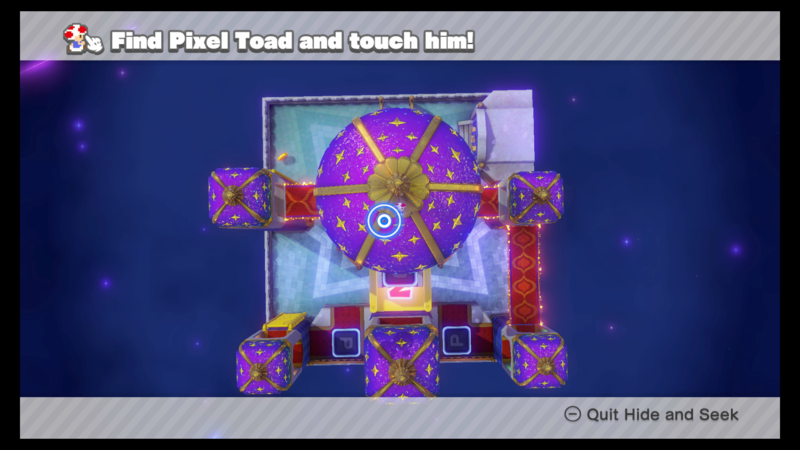 At the end of the level, a Pixel Toad is chilling out under the star podium. In the secret area next to the purple pipe, a Pixel Toad is hiding behind the tree stump enemies. 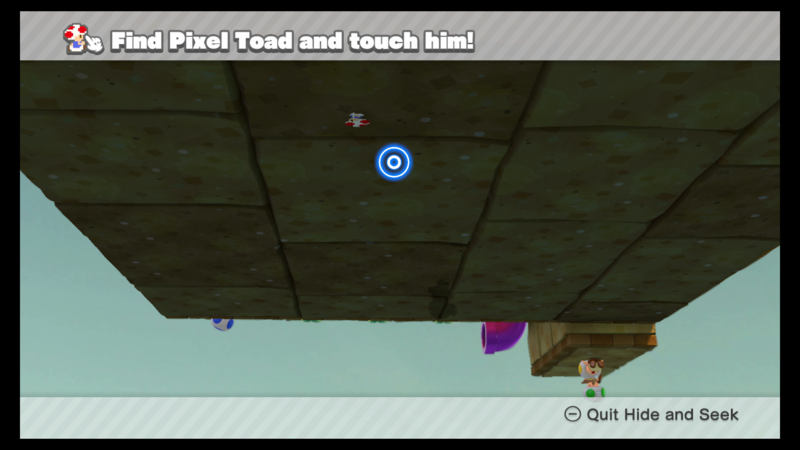 This Pixel Toad is located at the top of the map on the middle spire. 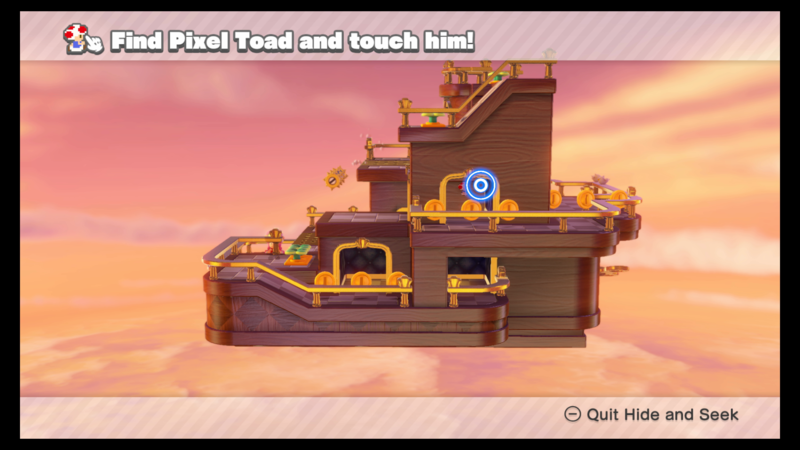 Right of the star's location, a Toad can be seen jumping out of the lava in the corner. 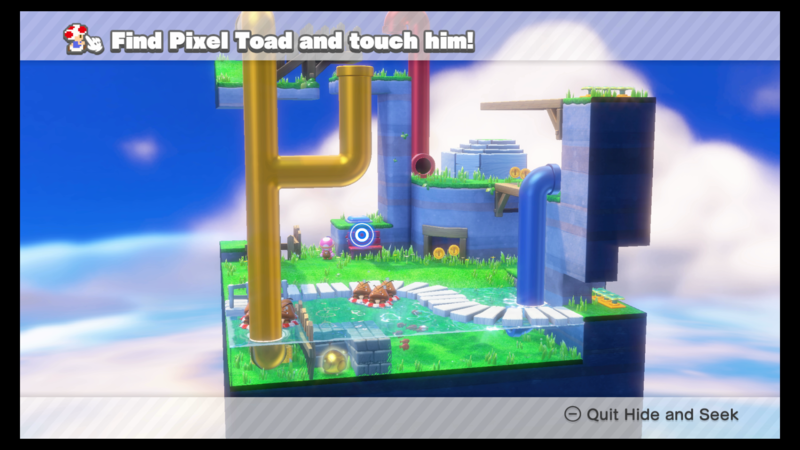 This Toad is right at the start of the level, walking between the green windows next to the Red Bullet Bill cannon. 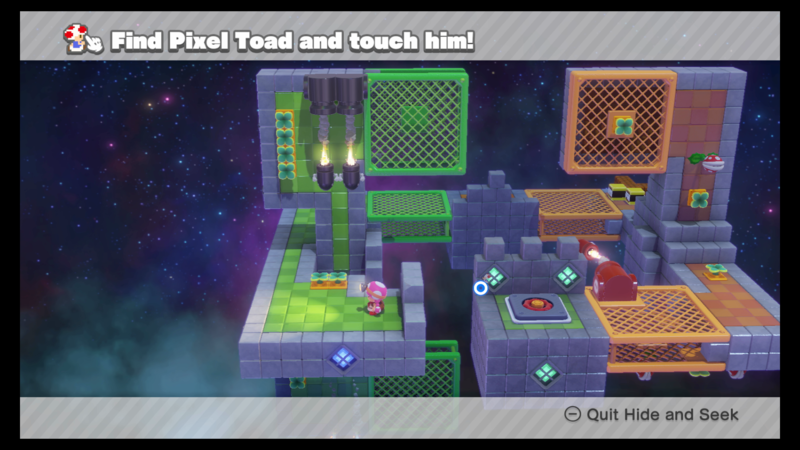 The final Toad is at the end of the last level, hiding under some blocks that can be destroyed by a cannon.